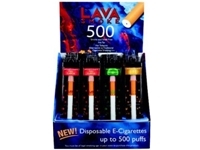 If you wantto reduce the intensity of nicotine during cigarette smoking then Lava Smoke Ecig Disposable ElectronicE-cigarette 500 puff is the best choice. It is highly beneficial means ofexperiencing the traditional cigarette smoking experience. Each puff issmokeless and thus reduces the harms caused by tar. This is available in avariety of exotic flavours including menthol, full flavour and Light at ouronline store. Impressiveprices and timely delivery are guaranteed if you buy it from us.